Multiple Teams · Aug 3 Club Tennis at OC Begins in October! 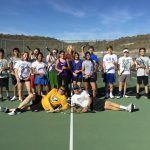 Boys and girls tennis club will begin in October. Sign up at club Rush or see Coach Younger room PA 214 and Harmonson in counseling on campus. All new, recreational or advanced players welcome to join.